It's pretty obvious that I'm a bit of a snack person as well as a foodie. I love nothing more than baking up sweet treats like cupcakes, brownies and biscuits, but I'm also always on the lookout for new things to try and new flavours to mix together. You can imagine how excited I was when WowBoxMe got in contact with me and asked if I'd like to try out one of their boxes. Of course, I said yes! And what's even better than that is that if you like what you see in this post, you can claim your free box by signing up here. * That's right, totally free! So what exactly is WowBoxMe? It's the perfect subscription box for people that are interested in food and trying new things without having to scour the internet or supermarket aisles to find good products. They offer two boxes, one that includes alcoholic drinks and one that doesn't, which is ideal for both parties. If alcohol is your thing, you can get a box for £9.99+p&p a month, or if you'd prefer the non-alcoholic box, that's only £6.99+p&p a month! Each month, you're guaranteed to get a box of 7-12 products that add up to over £20 - you're literally paying less than £10 for stuff over £20, how crazy is that? 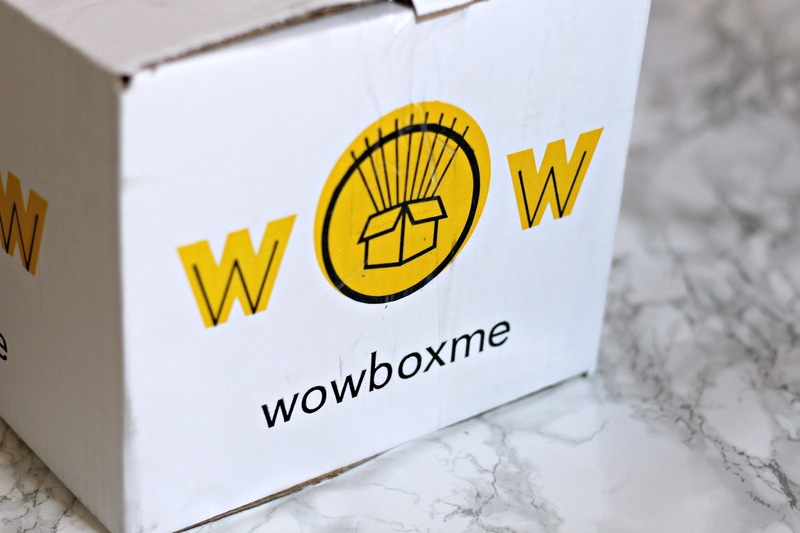 The first (free) box you receive is a total surprise, but after that, you are able to slightly customise the next boxes you receive by going on to your WowBoxMe dashboard and adding the bits and bobs you'd like. If you've got any more questions about the service, you can click here to see their FAQs, bot now let's see what I got in my box! The first thing that caught my eye when I prised open the box lid was the Maryland Creations Soft Centres. My sweet tooth was a-tinglin' and I just knew that those little guys would be right up my street. I was absolutely right! These cookies have got a crunchy outside, but a soft, gooey chocolate interior, which makes for a really fun sweet treat. My favourite way to enjoy these is warmed up in the microwave, as the inside gets super melty and it's just ridiculously delicious. Next up is the new Mars Choc Brownie Bar - how interesting does that sound? I'll be honest, I haven't tried this yet, but I bet it's absolutely scrumptious, and that's coming from someone that isn't the biggest fan of Mars Bars! One thing that I am a fan of though is green tea, so I was very excited to see a box of Ahmad Tea Pure Green Tea in the box. As the WowBoxMe product info booklet says, "Ahmad Tea is a UK based family business, drawing on 4 generations of tea blending and tasting experience," so I imagine that a cup of this will taste beautiful. Next up was a bottle of Oasis Apple Cherry Sour, which is gorgeous! I'm pretty much an advocate for Oasis - if I'm ever getting an on-the-go drink, I always go for Oasis. With that in mind, you can imagine how excited I was to try this. It still has the fresh and fruity taste of classic Oasis, but there's a yummy, sour flavour thrown into the mix. It's definitely one to try! I was really pleased to see a bag of Yushoi Snapea Rice Sticks in my box. I'd tried something similar to these a few months ago and loved them, so I knew that these would go down a treat. I haven't tried them yet, but I'm very much looking forward to! The only thing that was a little bit confusing about these rice sticks is that they weren't included in the product info booklet, but there was also something in the booklet that wasn't in the box. I'm not complaining though! Up next was another drink in the form of Lucozade Energy Pineapple Punch. I'm not big on energy drinks, so this was something that J snapped up straight away. He said that the pineapple flavour was quite strong and very sweet, so if you didn't fancy the sour Oasis, maybe this Lucozade will be up your street. How excited was I to see the Toffee and Popcorn Galaxy Duet? I've seen these bars in supermarkets so much recently, but never thought to treat myself, so I was practically buzzing when I pulled this out of the box! I haven't touched it yet, as I'm 100% certain that I'll love it and don't want to run out. Daft, I know, but toffee, popcorn and chocolate sound like a match made in heaven. 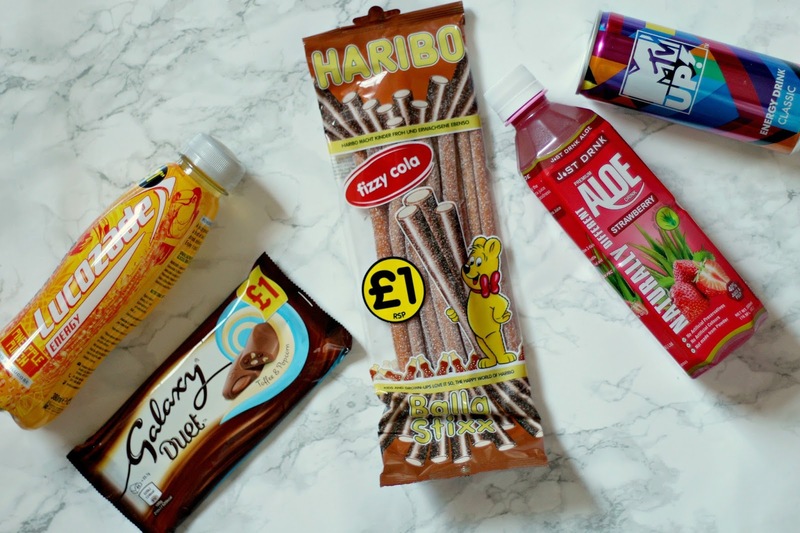 I'll be real, cola isn't one of my favourite flavours but the Haribo Fizzy Cola Balla Stixx are so so yummy. They remind me of fizzy strawberry laces, but obviously with a cola flavour. Each bite has a sour kick mixed with the sweetness from the creamy centre. Honestly, they're so nice - they're definitely one of my favourites from the box. But my top favourite was the Just Drink Premium Aloe Strawberry drink. I really can't quite describe the taste and texture of this drink, but I'll bloomin' well try. Of course, it has a sweet strawberry flavour, but there's a little something more and I can't quite put my finger on what it is. It's also runny, like a normal drink, but it has squishy, aloe vera pulpy bits floating in (that are so delicious, no matter how disgusting that description sounds). Honestly, sign up to this service or go find a bottle of this because you won't regret it! Last, but not least, is the MTV Up Energy Drink Classic. Again, I'm not an energy drink person, so this was another item that J grabbed. While we both loved the packaging of it, he said the taste wasn't really to his liking. He's into more sweet flavours and he said that this drink was kind of plain. That didn't stop him from drinking the whole can though! As you can see, I got a whole host of goodies and it was a really good mix of things. 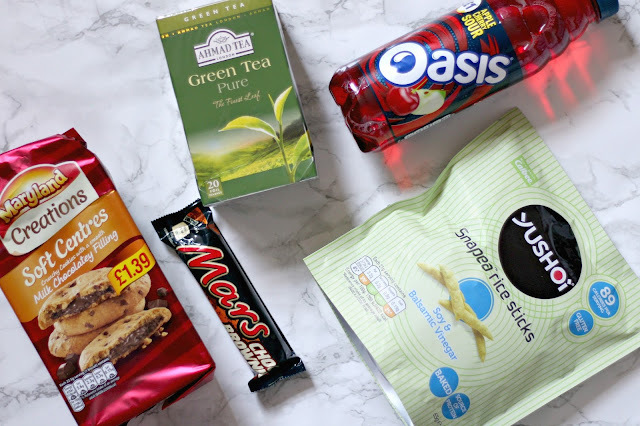 There were items that were kind of healthy and things that most definitely weren't, so if you're someone that's looking for a bit of variety, WowBoxMe is definitely the way to go! If you'd like to claim your free box, please click here* and sign up. Choose whether you'd like the alcoholic or non-alcoholic box, then you're good to go! It's such a fab subscription service for all of us foodies and snack-lovers, so make sure you grab your free box today. This box was sent to me for review purposes. All opinions are my own. Links marked with a * are part of an affiliate programme. that looks like a delectable box! it's funny, because usually these sub companies are trying to make super healthy choices. it's kind of refreshing to see a box that is just pure devilish enjoyment!